It was rumored that Jeffrey Dean Morgan shot two versions of Negan’s big entrance for the Season 6 finale: one for AMC basic cable standards, and another with speech in line with the comic book version of Negan — who swore his head off. We can now confirm that rumor is true, because the Blu-Ray and DVD releases of the season are going to contain the sailor-mouthed version of Negan. Anchor Bay’s press release, reproduced below, mentions a special “Extended Cut” of the episode available only on the Blu-Ray: it’s unknown if they mean this will be the only cut with the uncensored Negan scene or if both cuts will have it. Weirdly there is also a special feature mentioned that only the DVD set has. You don’t see that very often. The Season Six set will contain a lot of other stuff too, some of it standard (but no peek at Season 7!) 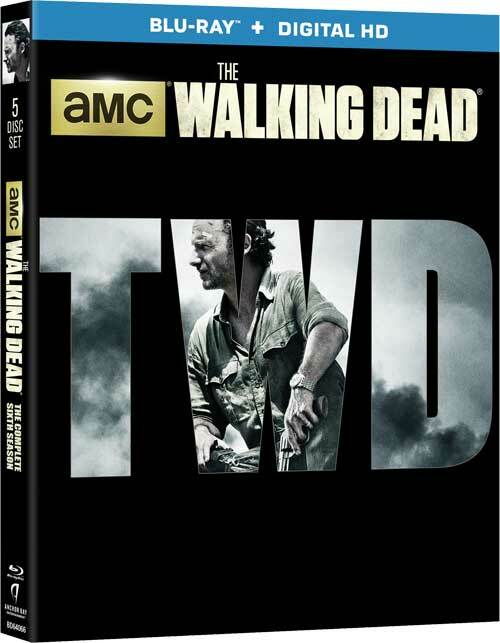 The Walking Dead Season 6 will be released on Blu-Ray and DVD August 23. BEVERLY HILLS, CA (June 21, 2016) – This past season brought many unforeseen, exciting and pulse-pounding twists and turns. With the end of every season comes the bittersweet knowledge that we must wait with bated breath until the next ride. “As ever, there’s no shaking Dead’s grip” raves Us Weekly. To keep your The Walking Dead appetite satiated, Anchor Bay Entertainment proudly continues the tradition of offering fans an opportunity to relive the ever-so-satisfying series by delivering The Walking Dead: The Complete Sixth Season on Blu-ray+Digital HD, and on DVD, on August 23. New cast members and guest stars for Season Six include Merritt Wever as Dr. Denise Cloyd, Ethan Embry as Carter, Corey Hawkins as Heath, Thomas Payne as Jesus and Jeffrey Dean Morgan as Negan. Season Six starts with Alexandria’s safety shattered by multiple threats. To make it, the people of Alexandria will need to catch up with our survivors’ hardness, while many of Rick’s people will need to take a step back from the violence and pragmatism they’ve needed to embrace. These reversals won’t happen easily, or without conflict. But now Rick’s group is fighting for something more than survival…They’re fighting for their home. And they will defend that at any cost, against any threat, even if that threat comes from within. Including never-before-heard audio commentaries, deleted scenes, six new featurettes, additional extras and the highly anticipated Alternate Negan Scene, the Blu-ray and DVD will be available for the suggested retail price of $79.99 and $69.98, respectively. Just like the previous award-winning home entertainment releases, The Walking Dead: The Complete Sixth Season will take fans down The Walking Dead memory lane so they can relive all of the season’s most haunting and indelible moments. The Walking Dead: The Complete Sixth Season cast includes Andrew Lincoln, Norman Reedus, Steven Yeun, Lauren Cohan, Danai Gurira, Lennie James, Chandler Riggs, Melissa McBride, Sonequa Martin-Green, Seth Gilliam, Michael Cudlitz, Alanna Masterson, Christian Serratos, Josh McDermitt, Ross Marquand, Austin Nichols, Alexandra Breckenridge and Tovah Feldshuh. The Walking Dead: Season 7 premieres on AMC this October. AMC is home to some of the most popular and acclaimed programs on television. AMC was the first basic cable network to ever win the Emmy Award for Outstanding Drama Series with “Mad Men” in 2008, which then went on to win the coveted award four years in a row, before “Breaking Bad” won it in 2013 and 2014. The network’s series “The Walking Dead” is the highest-rated series in cable history and the number one show on television among adults 18-49 for the last four years. AMC’s other current original drama series include “Better Call Saul,” “Hell on Wheels,” “Turn: Washington’s Spies,” “Halt and Catch Fire,” “Humans,” “Fear the Walking Dead,” “Into the Badlands,” “The Night Manager,” “Preacher,” and forthcoming “Feed the Beast,” “The Son” and “The Terror.” AMC also explores authentic worlds and discussion with original shows like “Talking Dead,” “The Making of The Mob,” “Comic Book Men” and the upcoming “Ride with Norman Reedus” and “The American West.” AMC is owned and operated by AMC Networks Inc. and its sister networks include IFC, SundanceTV, BBC America and WE tv. AMC is available across all platforms, including on-air, online, on demand and mobile. Anchor Bay Entertainment is a leading independent home entertainment company that acquires and releases a wide array of filmed entertainment in the theatrical and home entertainment markets, including STARZ Original series, children’s entertainment, fitness (Anchor Bay Fitness), sports and specialty films on Blu-ray and DVD formats. The company has long-term distribution agreements in place for select programming with The Weinstein Company, AMC Networks and RADiUS, among others. Headquartered in Beverly Hills, CA, Anchor Bay Entertainment (www.anchorbayentertainment.com) is a full service distributor in the North American market. Anchor Bay Entertainment is a Starz (NASDAQ: STRZA, STRZB) business, www.starz.com.